Spray the bottom of a 12 count muffin tin lightly with cooking spray. Cut the bread dough into 6 equal parts. Take each bread dough portion and flatten with your hand or with a rolling pin. With the muffin tin lying upside down, wrap each dough portion around the bottom of the muffin tin cup. Be sure to leave an empty muffin cup in between the 6 bread cups so that they do not touch. Bake for 10 minutes or until golden brown. Remove from oven and let cool slightly before removing from the muffin tin bottom. Slightly press the bottom of each bread cup to flatten. While bread cups are cooking, warm the soup either in the microwave or in a pot on the stove. Fill each bread cup with 1/3 cup of warm soup and serve. Need a super quick meal for Mardi Gras? It doesn’t get any easier than this! These Quick Gumbo Cups have that New Orleans flair with almost no work at all. 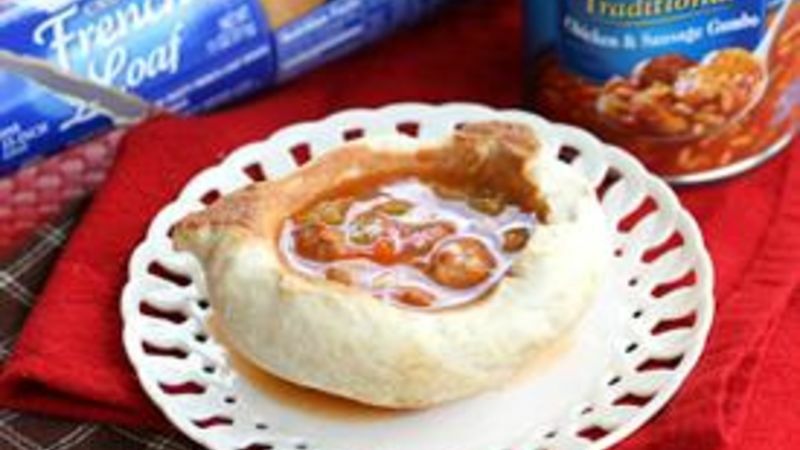 Bread cups made from Pillsbury™ refrigerated French bread are filled with warm Progresso™ Traditional Chicken and Sausage Gumbo. Really…no one will know that this flavorful gumbo came from a can. It’s just that good with that cooked-on-the-stove-all-day taste. People will be amazed at your “homemade” bread cups, too. Fill each cup with warm chicken and sausage gumbo and serve. Yum!